The archetype of the misunderstood genius, Vincent van Gogh has become one of the most renowned figures in the history of western art. With his dazzling colors, eloquent brush work, and disdain for the classical norms of painting, van Gogh revolutionized the nineteenth century art world and helped to prepare the ground for the pioneers of modern art. 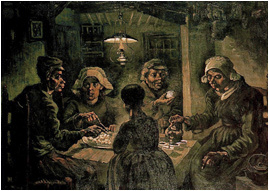 Vincent van Gogh was born Holland in 1853, one of six children of an evangelical pastor. 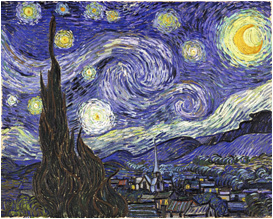 After various failed attempts at finding a profession, including a stint as a lay clergyman, in 1880 van Gogh committed himself to his artistic career. 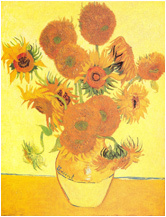 During his years as an artist, van Gogh was supported financially and emotionally by his younger brother Theo, an art dealer in Paris with whom he was extremely close. 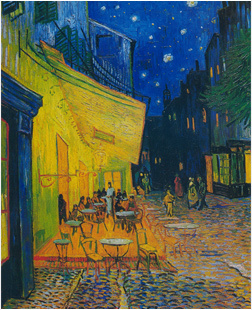 At the urging of Theo, van Gogh moved to Paris to launch his career as an artist. Here he encountered Impressionism, which had a huge influence on his work, and met several artists, including fellow post-Impressionist Gauguin. In 1888, van Gogh invited Gauguin to work with him in the “studio of the South.” The studio only lasted for two tumultuous months, terminating in perhaps the most famous anecdote of van Gogh’s life: after an explosive argument, the artist cut off his left ear and gave it to a prostitute as a gift, resulting in Gauguin’s immediate departure. The failure of the studio of the south was one of van Gogh’s major life regrets. Oil on canvas, 92.1 x 73 cm. Van Gogh’s work is characterized by its intensely rich palette of blues, reds, oranges and yellows, as well as acutely expressive brushwork. Van Gogh’s hand is unmistakable: his strokes are rhythmic and bold, agitated and swirling. The surface of his paintings tends to be thick and textured, perhaps speaking to the influence of fellow Dutchman Rembrandt, who van Gogh greatly admired. Oil on canvas, 82 x 114 cm. Oil on canvas, 81 × 65.5 cm. oil on canvas, 50.5 X 103 cm. Oil on canvas, 73.7 x 92.1 cm.